For this listing I would be explaining using the official pictures as I do not feel that my pictures do justice to her beauty. As usual, I will be viewing this Nendoroid in different sections and ranking as I see fit. 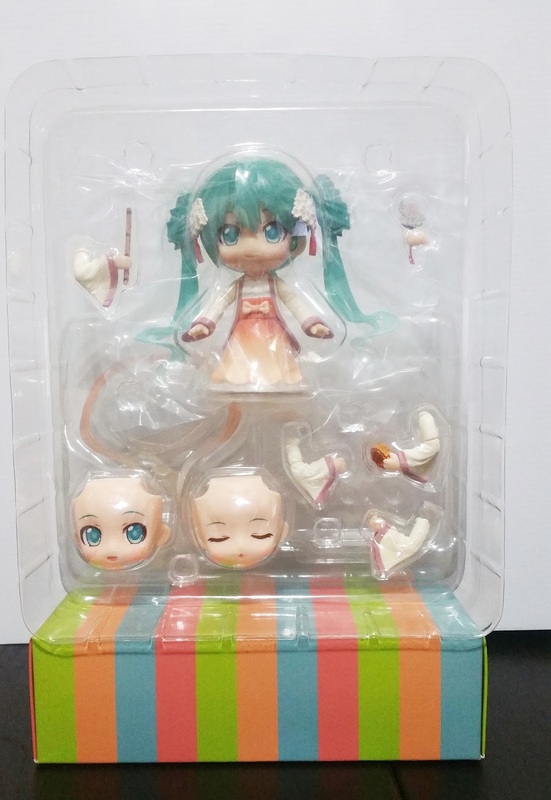 The design for this Miku's box is slightly different. It is more luxurious than usual, coming with this smoke-like effect as well as a more unique cut-out for the window as compared to the usual rectangular cut-out on usual Nendoroids. However, I was probably expecting something more unique, like a Snow Miku box, which wasn't the case, thus leaving me a little disappointed. Taking a look at the blister and all her parts shows that she comes with a fair bit. 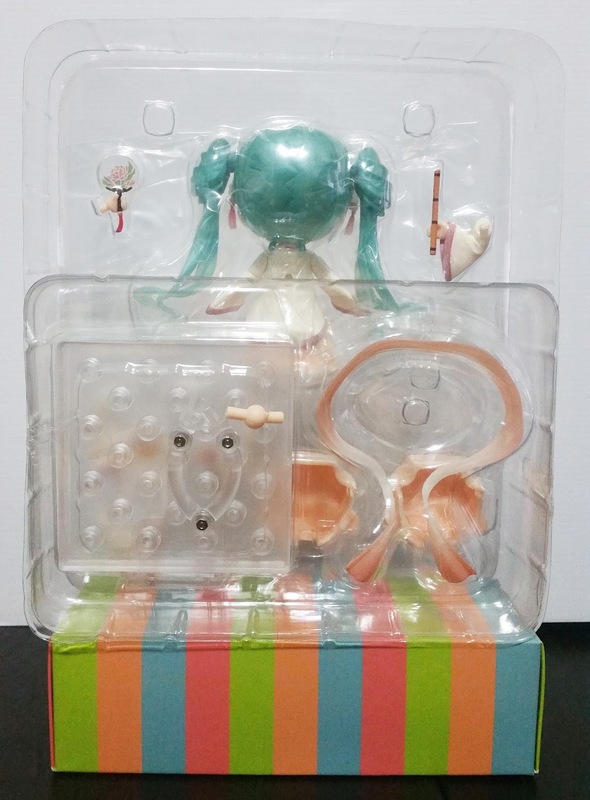 She has 3 faceplates, limbs, a moon cake, a fan, a flute and a backdrop along with her itself. 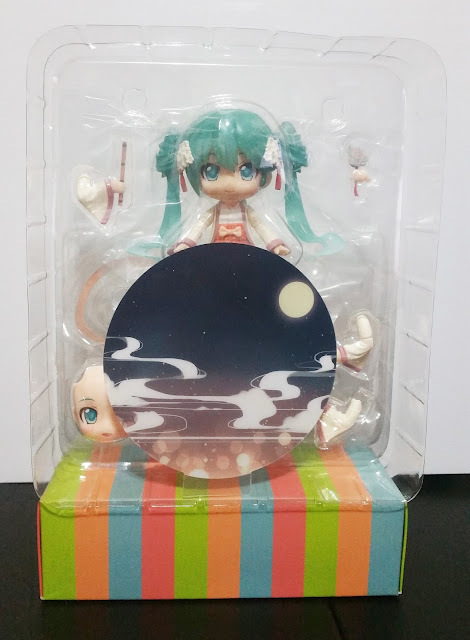 She comes with a larger base than most other Nendoroids so Harvest Miku is able to stand firmly on the base while space is left behind her to attach the backdrop. Though, apart from the larger size, there isn't much else notable for the base and undeniably, it still leaves a lot to be desired for this Nendoroid. 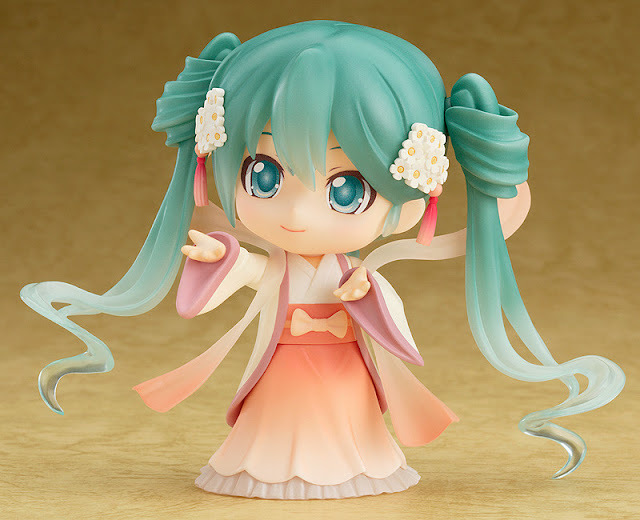 Harvest Miku is very pose-able even without the use of any accessories. However, as she comes under the theme of the Moon-cake Festival, it is only right that she comes with several suitable accessories, such as the flute and moon cake, which I would elaborate more on in the next section. For now, I would like to mention that the use of translucent parts are adequate and adds to her ethereal beauty which makes her a goddess of the moon. Her outfit is also one of traditional Chinese, which fits in with her theme better as Chang-e is of the Chinese mythology. Assembling her parts aren't difficult at all and the hardest part would probably by placing her raiment in place as you'll have to tuck it between her arms and waist in the right angle so it'll stay up. I particularly like the little ribbon at her waist as it adds a nice modern feminine touch to this figure. I love the sculpt of her hair and the flower accessories on her hair the most out of all the Miku Nendoroids available on the market as of now. Her hairstyle is really unique and that forms part of her cuteness. The hair accessories is another part of her special design and it actually adds on to her theme rather than just a simple accessory. In this figure, gradients are often used. Not only is it visible in her hair, the tassels on her hair accessories, but also in her outfit (skirt section) itself. These gradients do help give her more presence as a beautiful goddess. This faceplate that she has on in this photograph, the blushing one is my favorite faceplate that she has. The way she hides her mouth with the moon cake makes it look like she is hurriedly hiding her embarrassment, making her embarrassment more evident and thus, more adorable. Using this chance, I'll like to point out that the moon cake is extremely detailed as well. It has the ridges that you will normal find on a moon cake. There is still a design on the top (or front) of the moon cake, which is a nice detail that Good Smile Company added, looking as they could have possibly left it blank. 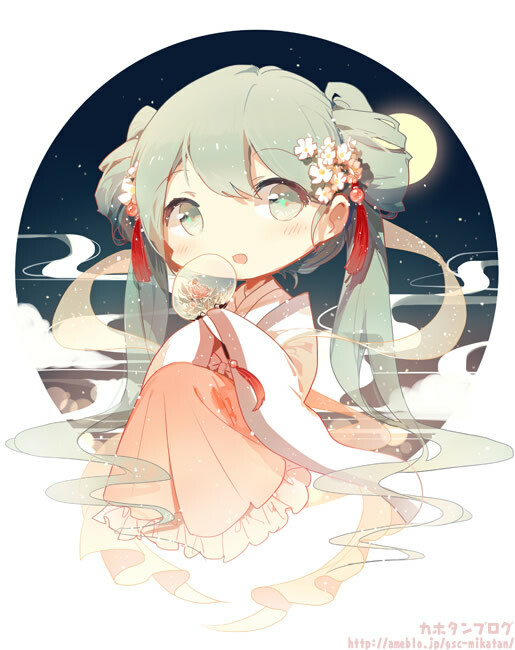 The fan which Miku is holding is something which is commonly seen in an Ancient Chinese context. Though a folding fan could be used as well, in this case, I found it more appropriate for this hand fan to be used after comparison. It looks much more elegant and somehow just more deity-like than using a folding fan. Likewise, Good Smile Company could have left it blank, but the lotus image on it is very fitting. Pale red and green for the flower helps to make it appear more visually appealing. The "frosted" translucent material used further adds to it appearance. 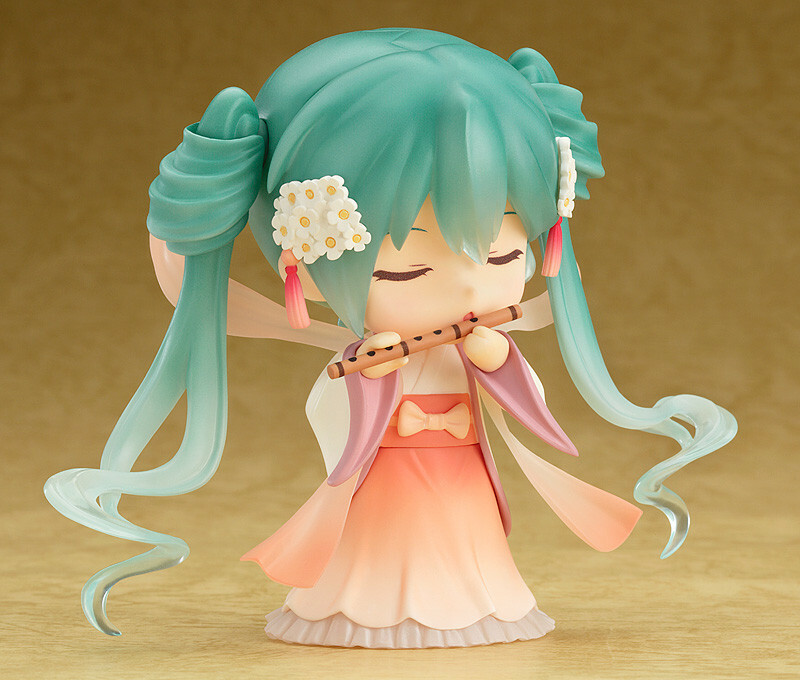 The last major accessory which Harvest Miku came with is her flute. The color of the flute is natural though jade is constantly used for flutes as well, perhaps the main reason as such would be that the green would clash with Miku's green hair color, while the brown color would pop from most of Miku's features. My only gripe about the flute is that the black lines used are slightly too thick on a Nendoroid of such small scale. In contrast, this makes the flute looks much shorter visually. This is the original illustration which Good Smile Company based the Nendoroid off of. Although Good Smile Company made a valid representation of this figure, there are still several inaccuracies which I wish to point out. 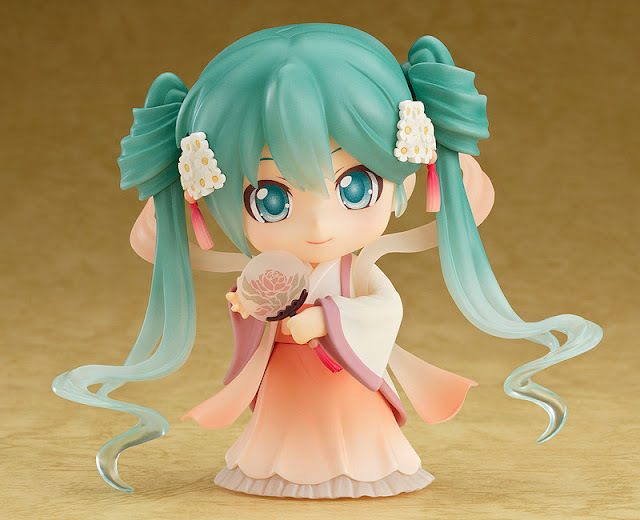 Firstly, this Nendoroid has faced slight criticism on its eyes as the eyes used in the illustration is not accurately depicted in the Nendoroid, where the usual Nendoroid Miku eyes are used instead. This results in complaints about how a cute quality of this illustration was failed to be represented properly. 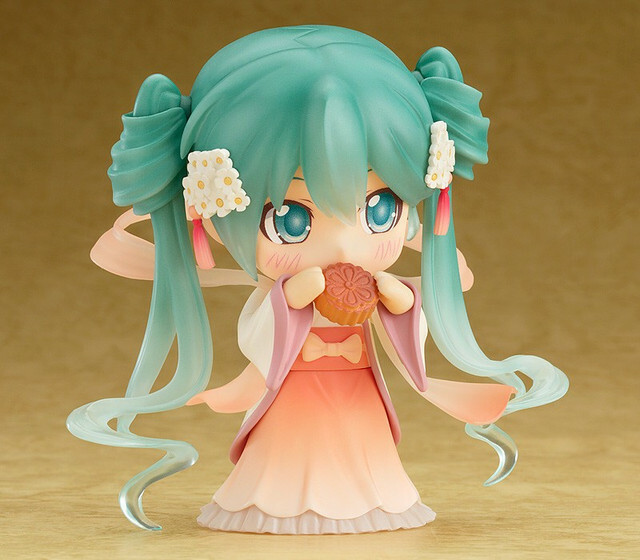 Another would be the jacket or cardigan part, which is seen to be hanging loosely off Illustration Miku's shoulders, but worn properly by Nendoroid Harvest Miku. Although I do agree that with the cardigan hanging loosely, it would add more to her theme but at the same time, it would make her parts more fragile, so I'll be contented with this. 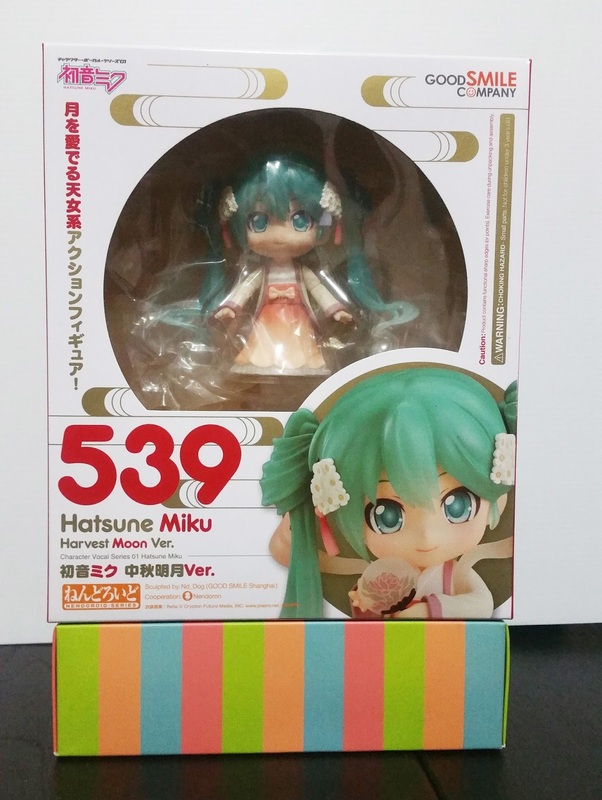 No Comment to " Figure Unboxing and Review: Nendoroid Harvest Miku (Good Smile Company) "